The Beal island Bridge over Jonesport Harbor, near Machias, Maine. Although Machias is a town of just over 2,000 people, it is home to a university, public airport, the Washington County seat, and numerous historic sites. The name Machias came from a Passamaquoddy word meaning “bad little falls,” referencing the local Machias River, which runs directly through the town. 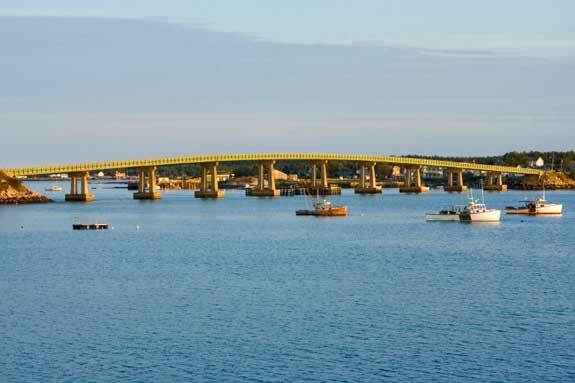 The surrounding Machias Bay area has numerous towns with fascinating attractions, including Cherryfield, Columbia, Cutler, Jonesboro, Jonesport, Milbridge, Roque Bluffs, Addison, Bucks Harbor, Harrington, Marshfield, Northfield, and Whitneyville. A vacation to this area of Maine’s Downeast and Acadia region is certain to delight visitors of all ages. The banks of the Narraguagus River were once covered with wild cherries, earning Cherryfield its name. Today, the town is better known as “The Blueberry Capital of the World” and has one of the largest black bear populations in the country. Come in the late summer when blueberries are in season for a fresh, delicious treat. When visiting Cherryfield, explore the Cherryfield Historic District. This area comprises approximately 75 acres of land on either side of the Narraguagus River and is on the National Register of Historic Places. With 52 historic buildings, this is one of the finest examples of a 19th century New England riverside community in the country. Walk through the Historic District to see examples from several architectural styles, including Federal, Greek Revival, Queen Anne, Italianate, and Colonial Revival. Make special note of Second Empire style homes, which are found in larger urban areas but were relatively uncommon in Maine’s smaller towns. Former politicians, early settlers, and other prominent Cherryfield residents once lived in these homes. Columbia and Columbia Falls are located just west of Machias. These small villages are worth a visit for their buildings listed on the National Register of Historic Places. The Ruggles House in Columbia Falls is a superb of Adamesque-style Federal period architecture. The home, built in 1818 for a wealthy judge, lumber dealer, postmaster, and local militia captain, has been restored with original furnishings. Union Church is another historic building in Columbia Falls. Constructed in 1849, this church was given to the town in 1902 to use as a town hall. Today, the Greek Revival style building is home to the town library and historical archives. Stop by to learn more about the area’s local history. Other buildings on the National Register of Historic Places include Bucknam House, Columbia House, and Ichabod White House. Cutler is located on Machias Bay, providing excellent opportunities for sea kayaking, boating, and fishing. It is also the site of a naval station that transmits very low frequency communication to the U.S. Navy’s submarines, making it an important site for the military. Cutler is also the site of the Cross Island National Wildlife Refuge. This refuge consists of six islands: Cross, Outer Double Head Shot, Inner Double Head Shot, Scotch, Old Man, and Mink Islands. The protected area is over 1,700 acres in size and is an excellent place to hike, snowshoe, and view wildlife. White-tailed deer, osprey, songbirds, bald eagles, and many other animal species call the wildlife refuge their home. The fall is an especially fun time to visit, as it is migration season for thousands of songbirds, shorebirds, raptors, and waterfowl. Ornithology enthusiasts will enjoy spotting nesting razorbills, which can only be found at three other sites in the Gulf of Maine. Jonesboro is a town of just over 500 people known for its natural beauty and wild blueberry harvest. Golf lovers will enjoy the Barren View Gold Course, a 9-hole course overlooking an expanse of blueberry barrens. The upscale Chandler River Lodge is on the former homestead of Hate Evil Hall, which was founded in 1797. This historic property is located on the Chandler River, providing breathtaking scenery and a variety of recreational opportunities. Jonesport is surrounded by Alley Bay, Wohoa Bay, and Chandler Bay, making it an excellent place to take in the fresh coastal Maine air. Sea kayakers will enjoy exploring the rocky coastline and its many coves. Fishing is an essential part of Jonesport’s economy, making this an excellent place to try the local lobster. Take a boat tour of the area to see the Moose Peak Light, a lighthouse established in 1826. Although the lighthouse is not open to the public, it is a well-loved photo opportunity for visitors to the area. Great Wass Island Preserve is part of the town of Beals, just south of Jonesport. The 1,540-acre preserve features an exposed granite bedrock shore, extensive marine exposure, and a unique ecosystem. The meeting of the Gulf of Maine and the Bay of Fundy creates a cold humid oceanic climate, fostering the growth of several rare plant species. When exploring the preserve, look for large stands of jack pine, acidic peat bogs that harbor carnivorous plants, rare dragon’s mouth orchids, harbor seals, and several species of birds. Western Brothers Island is another land preserve known for its natural beauty and wildlife. The Jonesport Historical Society collects artifacts and historical documents relating to local history. As a remote maritime village, Jonesport has a unique history and deep ties to the fishing industry. The library, founded in 1893, contains a collection of Jonesport historical items. Established in 2008, the Maine Coast Sardine History Museum is a fascinating and unique attraction. At its peak, Jonesport was home to 15 sardine canneries. Museum collections include original cans and labels, shipping crates, letterheads, photographs, and canning equipment. After visiting the museum, you will have an excellent grasp of the process that brings sardines from the sea to your table. Machias Seal Island is a beautiful island in the Gulf of Maine claimed by both the United States and Canada. Although it is barren, fog-bound, and has no trees, it has a special type of beauty. Bird watchers enjoy the island, which is a sanctuary for razorbills, common murres, common terns, Arctic terns, Atlantic puffins, common eiders, and Leach’s storm-petrels. The island is only accessible by boat; the Libby Island Lighthouse is also visible from a vantage point on the island. Larrabee Heath Preserve is known as a coastal sedge bog, meaning that it has a carpet of stunted shrubs and deer-hair sedge. This fascinating ecosystem is home to reindeer lichen, mosses, peat, and herbs. Look for the Crowberry Blue butterfly, which is found only in this habitat. After visiting Machias Bay and offshore islands, enjoy the freshwater lakes just north of Machias. Gardner Lake, Hadley Lake, and Rocky Lake are popular fishing holes among locals. Canoeists and boaters also enjoy relaxing on these lakes. Lovers of military history will appreciate Fort O’Brien State Historic Site. Built in 1775, the fort was active during the Revolutionary War, War of 1812, and Civil War. A historic cannon and Fort Machias occupy the site, which is also considered the birthplace of the U.S. Navy. Fort O’Brien State Historic Site is free and open to the public. Liberty Hall in Machiasport was built in 1873 in the Italianate style. The hall was established at the site at which local colonists captured the H.M.S. Margaretta from the British in 1775, the first sea battle of the Revolutionary War. The hall has a large theater and hosts a variety of social events. The Nathan Gale House is home to the Machiasport Historical Society and Museum. This beautiful 1810 home contains a large collection of old photographs, antique furniture, housewares, a genealogical library, and other memorabilia. Machiasport’s proud shipbuilding heritage and seafaring history is emphasized throughout the museum. The Burnham Tavern Museum is one of 21 buildings in the United States named most significant to the American Revolution. It was here that local settlers debated about plans to capture the armed British ship the Margaretta to start the naval portion of the Revolutionary War. The tavern was then used as a hospital to treat the wounded from the skirmish. Today, the museum chronicles Machiasport’s rich and colorful role in the American Revolution. Each August, the region celebrates at the Machias Wild Blueberry Festival. The little berry is at the cornerstone of the Machias economy, as the Downeast region produces 85% of the world’s blueberries. Enjoy the blueberry musical, a festive parade, fun run, blueberry cooking contest, blueberry quilt raffle, or blueberry pie-eating contest. The festival features local arts and crafts as well as live music. It is a free event that has fun activities for family members of all ages. The Machias area is a popular place for visitors to stay when coming to Downeast Maine. The town offers several motels, inns, bed-and breakfasts, cabins, and vacation rentals. Whether you are staying one night or a week, this area has accommodations to meet your needs. Located at the location where the Narraguagus River opens into the scenic Narraguagus Bay, approximately 1,300 people call Milbridge home. The town is an easy gateway to the Maine Coastal Islands National Wildlife Refuge, previously known as Petit Manan National Wildlife Refuge. This is an excellent place to view nesting seabirds, many of which are endangered or threatened species. The island offers hiking paths with spectacular views of Dyer Bay and Pigeon Hill Bay. Roque Bluffs, located on Englishman Bay, is a small village with incredible views of the ocean. Roque Bluffs State Park is a must-see park with incredible diversity. Its sand and pebble beach is unusual for the Downeast region, where rocky cliffs are more prevalent. The beach is a popular swimming site during the summer months. The park also offers a 60-acre pond for freshwater swimming opportunities. Hike through the six-mile trail network, explore Englishman Bay and Simpson Pond with sea kayaks, or look for unique bird species in this spectacular park. Visit the following directories to find lodging, dining, attractions, shops, services and recreational activities in the Machias, Maine area.